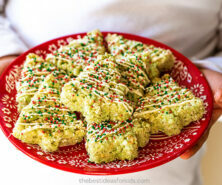 Making Rice Krispie Christmas treats can be a cinch with this easy to follow recipe! 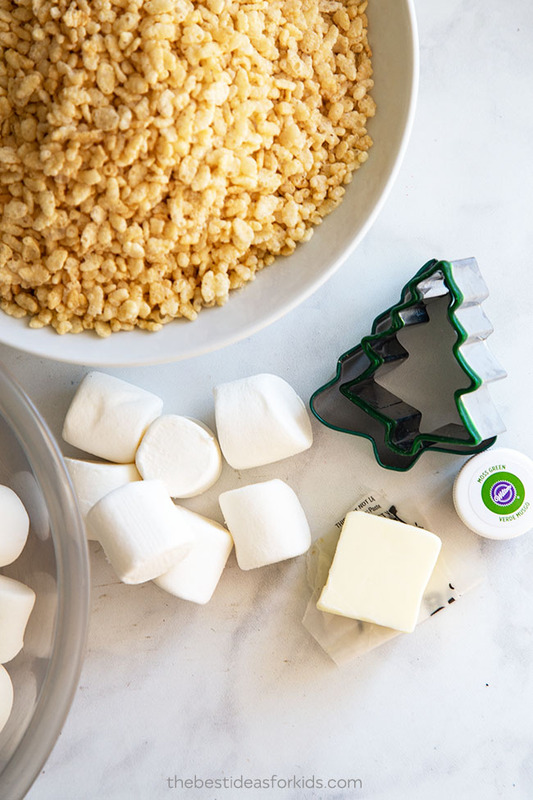 We’ll show you how to make Rice Krispies Christmas trees. You just need a few ingredients and a cookie cutter and you’ll have this fun holiday treat to serve up! If you’ve ever made Rice Krispies before, you know that they are a family favorite. 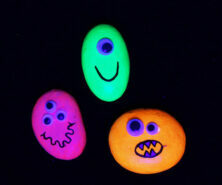 Not only that, they are easy to whip together for a fun afternoon activity with the kids. Kids can help mix them up, use the cookie cutters and add the icing and sprinkles. 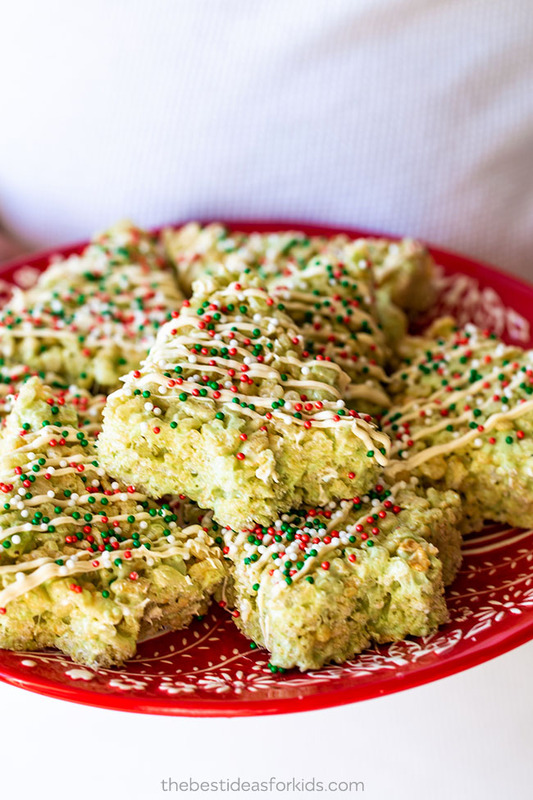 The best part is these Rice Krispies Christmas Trees will be loved by almost everyone! Tip: To get the softest Rice Krispie treats do not overcook the marshmallows. It is best to melt these on really low heat to ensure they do not overcook. The trick here is to not have your full rice krispies be too high or thick. When you are placing down into a pan, spread out evenly and make as shallow as possible. If you have extra Rice Krispie mix, instead of making the Rice Krispies higher, place them in two pans. The best way to cut into unique shapes is to use cookie cutters! For Christmas you can also do candy canes, stars, bells and snowflakes. Really any cookie cutter will work the same. Firmly press down with your cookie cutter. It will also help to grease your cookie cutter with some butter so that it doesn’t stick when you’re trying to pull the cookie cutter out. 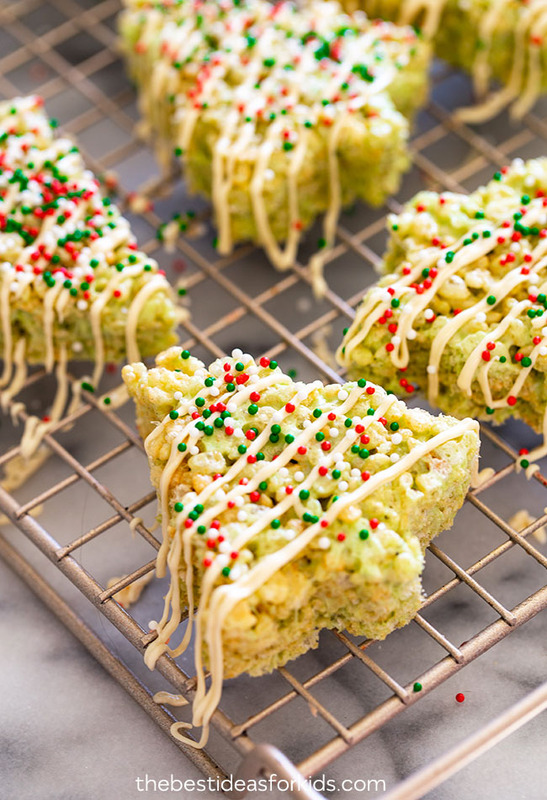 You can decorate your Christmas rice krispie treats with sprinkles and icing. Alternatively you can get these mini M&M’s and make it look like they are ornaments on your Christmas tree. Use the icing to make it look like garland and then place the mini M&M’s to look like ornaments. 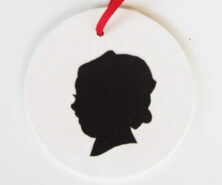 If you are making these for a Christmas bake sale, you can buy disposable or cheap plastic plates to place them on. Then get some cellophane and wrap up and around the plate and tie with some ribbon. Do you put Rice Krispie Treats in the Fridge? No, you do not need to put them in the fridge. For best taste and texture it is recommended you consume within a few days. After this, they start to get hard and lose their freshness. You can store them at room temperature for up to 3 days or 6 weeks in the freezer. To maintain freshness when storing, ensure you place in an air tight container or place saran wrap on top. Follow the full recipe to make these treats here! 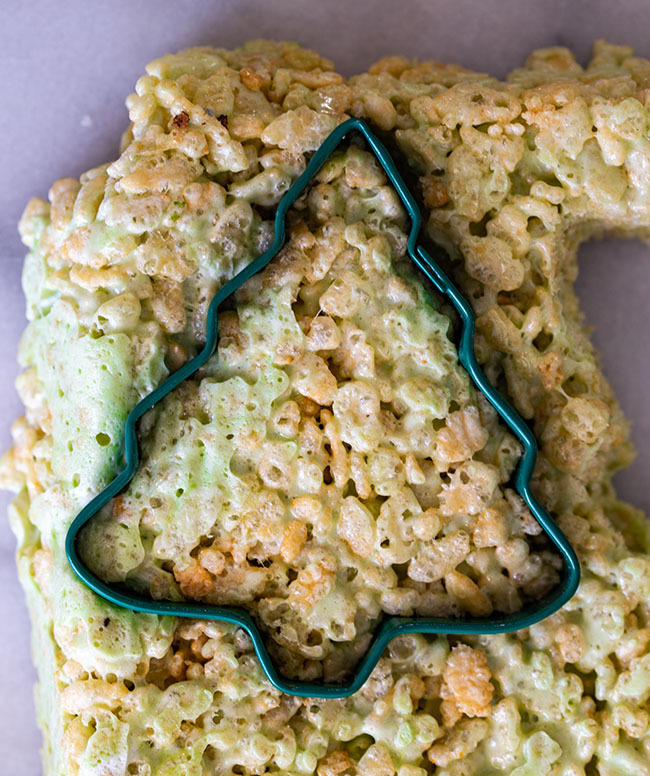 An easy recipe and tutorial for making Rice Krispie Christmas Trees. 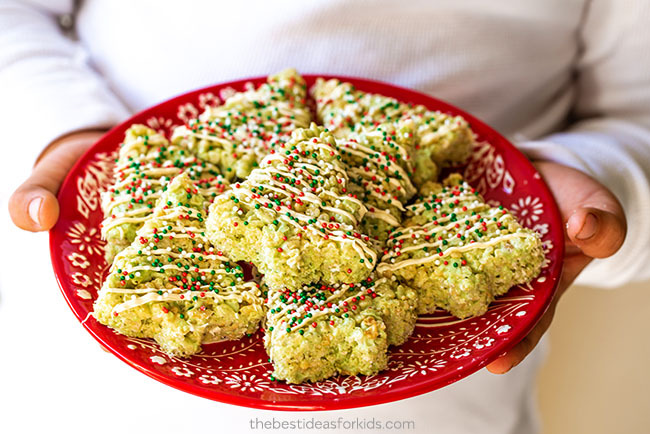 The perfect Christmas Rice Krispie treat! Spray a 9x9 inch square pan with non-stick cooking spray or line with parchment paper. 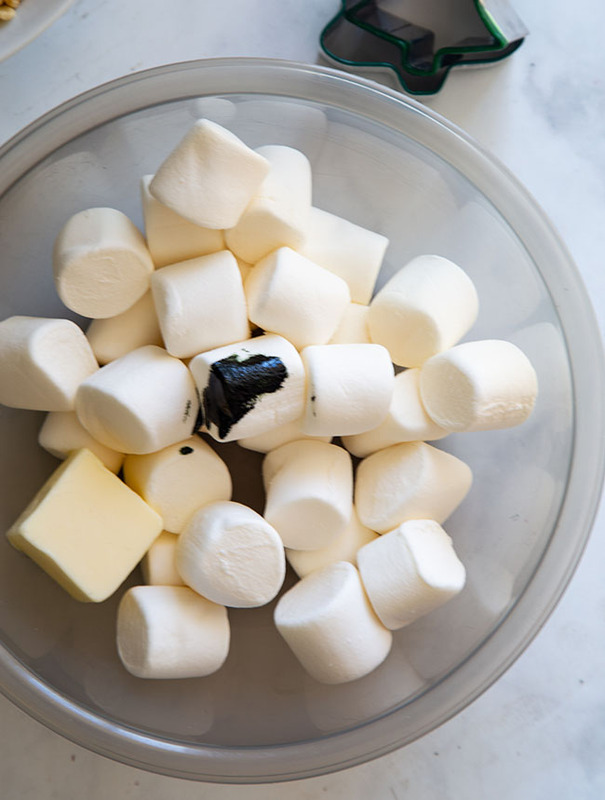 Place the butter, marshmallows, and a few drops of green food dye in a large non-stick pot. Carefully melt on low heat, stirring frequently until melted. Add the Rice Krispies to a bowl and stir with the melted marshmallows and butter until well combined. Spoon the mixture into the prepared pan, spread evenly. Spray your clean hands with non-stick cooking spray and press mixture down. Set pan aside for about 20 minutes to cool and set. 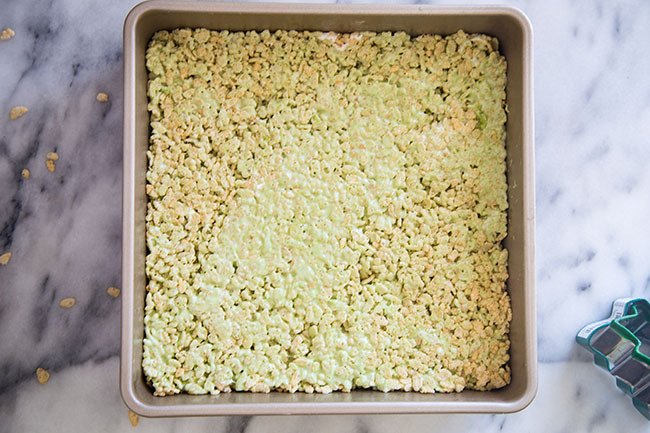 Remove the Rice Krispies block from pan and transfer to a cutting board. Using a Christmas tree cookie cutter, cut out the Christmas Tree shapes. In a small microwave safe bowl, Heat the white melting chocolate for 30 seconds, then stir until smooth. Continue heating for 30-second intervals, as needed until smooth. Transfer melted chocolate to a Ziploc bag and clip the corner. Drizzle over the Christmas trees and sprinkle with Christmas sprinkles. 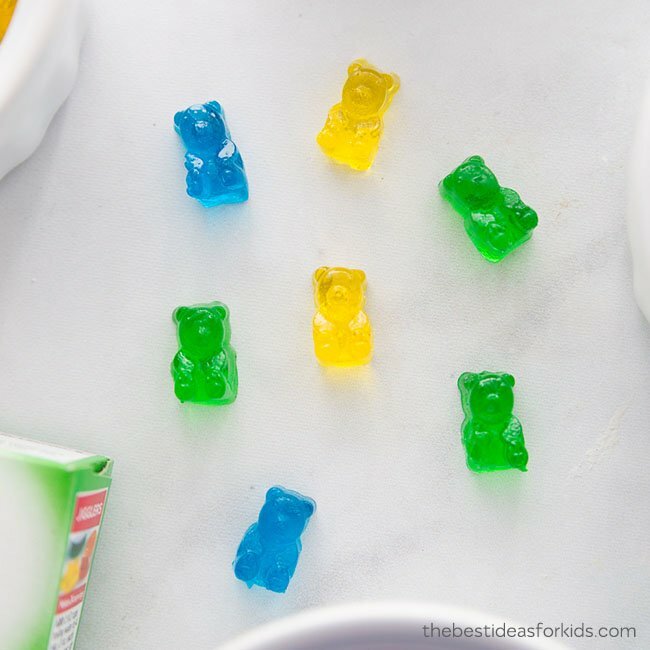 For another really easy treat idea for kids – try making this easy gummy bear recipe.